For months, your baby bump has been a source of joy and happiness. Now that you and your little one are finally united, you might find your body has changed. If you’d like to beat the bump and get your pre-baby body back in no time, then Power Plate has a great fitness plan that’s perfect for you! Women all over the world know that being a mother is a full-time job, and using the Personal Power Plate is a quick and highly effective way to keep feeling great every step of the way. The gentle vibrations will increase blood flow to bring much needed oxygen and nutrients to your healing body without you having to jump around performing unsuitable exercise for your level of recovery. With just 10-30 minutes on the Personal Power Plate, you can activate your core, rebuild strength safely and reduce lower back pain that is often synonymous with being a new mom. All pregnant mums have some level of Diastasis Recti by the third trimester. This programme will help to heal your diastasis and narrow the gap which is causing your weak core and pooched tummy. This programme is safe to start as soon as you have been cleared for exercise by your health professional, normally six weeks post-birth or -surgery. Women whose babies aren’t babies anymore! It’s never too late to improve your core and pelvic floor function, tone and strength. After regularly using it for just two weeks I started to see results and found it easily fitted into my day. The videos available online were varied and easy to follow and the exercises worked my whole body, which I liked. I enjoy the great recipes in the kick-start meal planner, I find the exercises fun and easy to do at home. 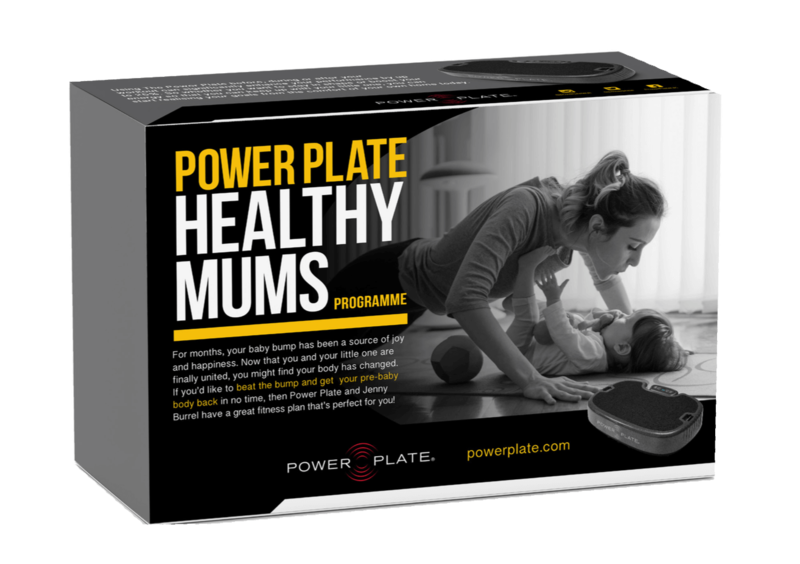 The Power Plate Healthy Mums programme has given me a way to beat my twin baby bump and work towards getting my pre-baby body back. My improved core and pelvic floor strength has given me back so much confidence. And it fits perfectly into my hectic days! Currently on week three of the 12-week programme (baby number 3… 9 months old.. 3 C-sections). My core is already noticeably stronger! Loving It! – Fahrzinmehr, A. A Comparative Study of Whole Body Vibration Training and Pelvic Floor Muscle Training on Women’s Stress Urinary Incontinence: Three- Month Follow- Up. J Family Reprod Health. 2015 Nov; 9(4): 147–154. Visit one of these affiliate partners for a demonstration session.